With four points after three matches, Nepal now is at second place on the points table whereas the UAE that defeated Kuwait U-19 holds firm grip on qualification with six points after three matches. In net run-rate, Nepal’s 3.209 is superior than UAE’s 1.598. Only one team from the group will qualify for the ICC U-19 Cricket World Cup to be held in South Africa in 2020. With two league-round matches to go, now Nepal must win both matches against Oman and Kuwait while the UAE needs to lose at least one of the remaining two matches against Oman and Singapore to qualify for the World Cup. In a scenario where Nepal loses one of the remaining matches, UAE will have to lose both matches which seem unlikely in current form. In firm UAE looks favorite to progress to world cup. 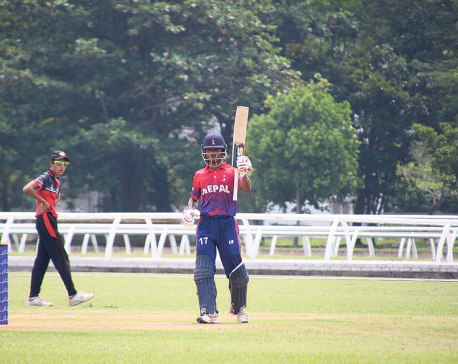 In Monday’s match, Nepal’s Rit Gautam scored an unbeaten 39 runs from 45 deliveries which included five boundaries and shared an opening partnership of 42 runs with Pawan Sarraf and 46 runs with former captain Aasif Sheikh to complete the chase of 93 runs in 13 overs for the loss of two wickets. Sarraf made 19 runs in the innings including two boundaries and a six during his 14-ball stay whereas Aasif contributed a quick fire 26 runs from 18 deliveries which included three boundaries and a six. Skipper Rohit Kumar Paudel sealed the match in style scoring a six off his first delivery of the match securing the commanding win boosting up the net run-rate. Malaysia’s Afiq Syakir and Syukri Madeli shared a wicket reach. Earlier, Nepal won the toss and invited host team Malaysia to bat first. Kamal Singh Airee dismissed both the opening batsmen within 4.2 overs to give Nepal a dominant start in the match. Skipper Muhammad Amir and Iezzat Daniel Fiqry’s cautious batting helped Malaysia reach 62 runs for the loss of three wickets at the end of 17 overs. However, Nepal spin-trio of off-spinner Sarraf, left-arm spinners Kushal Malla and Sagar Dhakal wrapped up the Malaysia innings sharing seven wickets for 30 runs in next 100 deliveries of the first innings. Sarraf grasped his second player of the match award of the series picking up three wickets supported by Malla’s three and Dhakal’s a wicket in the match. Fiqry top-scored for home team with 37 runs from 55 deliveries which included three boundaries and a six whereas Amir and wicket-keeper Hakim Harisan were the only other double-digit scorers in the innings contributing 13 and 10 runs respectively. In other matches of the day, UAE defeated Kuwait by a seven-wicket win with 252 deliveries to go in the match. Kuwait was bundled out for 56 runs in 26 overs after winning the toss and electing to bat first. Player of the match Aryan Lakra picked up five wickets to strengthen the UAE’s stance at the top of the league. Similarly, Skipper Aman Desai smashed 65 runs in Singapore’s five-wicket win over Oman in a match played at Kinrara Academy Oval in Kuala Lumpur, Malaysia. Oman scored 244 runs in 50 overs for the loss of nine wickets after winning the toss. Rain intervened in the match as target was re-adjusted to 179 runs in 37 overs which Singapore completed with eight balls to spare. In the fourth round of league matches, Nepal, Malaysia and Singapore will face Oman, Kuwait and UAE respectively on Tuesday.